An aerogel which is like a sponge but with much smaller pores is produced by removing the liquid from the very small pores of a wet gel which is something like gello. This is usually done by a process called supercritical drying. It is a crucial step in aerogel production since an aerogel cannot be produced if drying is not carried out properly. Moreover, the process is considered to be a slow process but it is not known how long the drying time will be. The cost of aerogel production depends very much on the drying time. Therefore, estimation of how long it takes to completely dry gel particles is essential to design, optimize and operate these drying units. No models had been developed for supercritical drying of particles at the beginning of the project. Supercritical drying is a very complex process in which several phenomena take place depending on the operating conditions and gel properties. Therefore, estimation of drying behavior requires development of a complex mathematical model. In Nanohybrids, we could develop such model which can predict drying time given the operating conditions and gel properties. For that, we first developed a unique experimental setup which enables us to obtain very accurate drying data with organic gel particles. 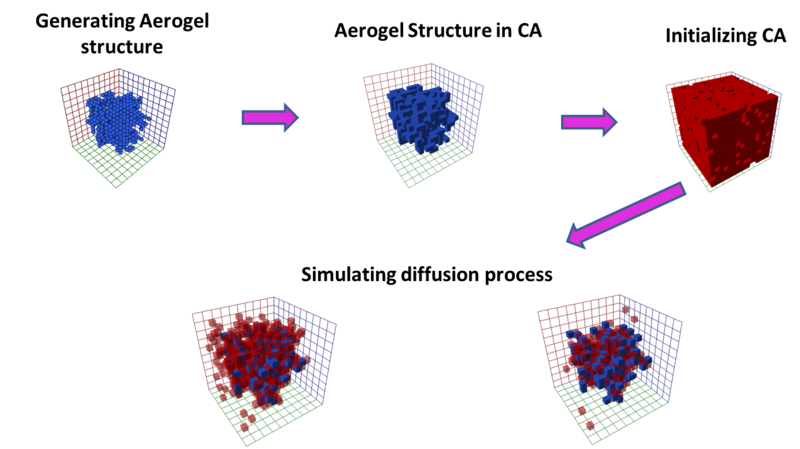 Then using this data, we developed a drying model based on partial differential equations. 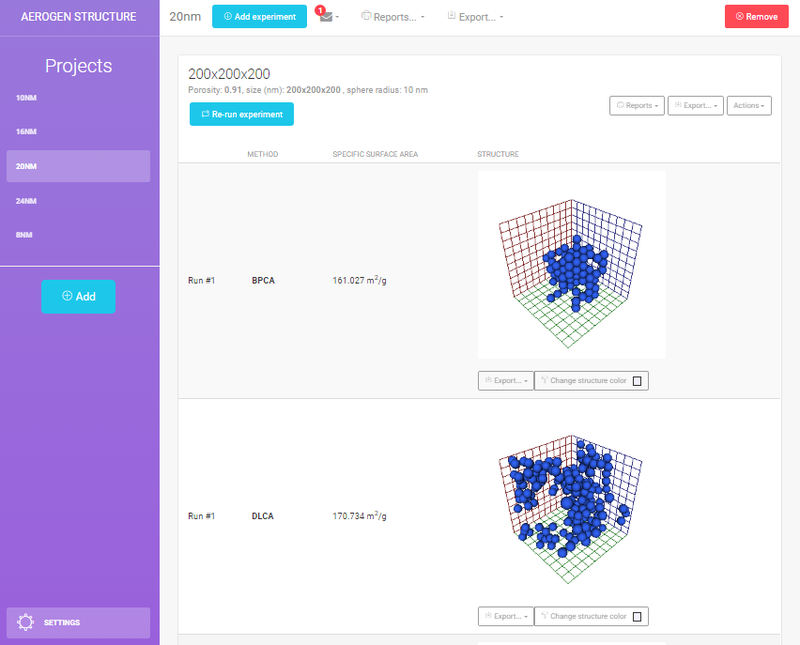 Now, with the help of our model, we can predict how fast the drying takes and what the optimum operating conditions would be in the supercritical drying unit for cost minimization of aerogel production. The developed model is also a very powerful tool to provide insights in proceeding from laboratory to industrial scale production of aerogels. What was the modelling about? The modelling was focused on comprehensive numerical simulation of supercritical drying process carried out in autoclaves of different volume, considering internal nature and structure of aerogels as well. A mathematical model, developed in the framework of the Nanohybrids project, was implemented basing on methods and approaches of Computational Fluid Dynamics (CFD) and Cellular Automata (CA). CA approach was used to generate structure of aerogels of different nature, and to describe diffusion of a solvent inside wet gel during supercritical drying. A special software was developed for this purpose. The main aim of simulations was prediction of supercritical drying kinetics considering different autoclaves’ designs and dimensions. The developed model describes hydrodynamics, mass, and heat transfer. What was the main contribution of modelling to the results of NanoHybrids? The main contribution of numerical experiments, carried out using the implemented model, was an ability to perform scale-up process. Results of simulations showed how internal arrangement, dimensions, and positions of inlets and outlets of pilot-scale autoclaves affect fluxes of supercritical carbon dioxide, solvent’s concentration, pressure and temperature profiles. Basing on these results, supercritical drying kinetics at pilot scale were investigated. The corresponding design and process modifications were offered. What were the main (and perhaps most impressive) results which have been achieved? The most impressive result is a creation of multiscale comprehensive model of supercritical drying which describes mass and heat transfer phenomena at nano, micro and macro scales by considering aerogels’ structure influence. How does this help to facilitate or improve the production of spherical aerogel particles in pilot scale? 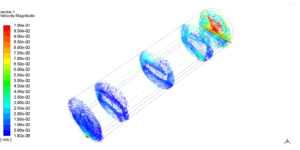 Results of numerical simulations help to improve quality of spherical aerogel particles by calculation of the required supercritical drying time and make the scale-up process easier. The implemented CA-based software can be used for designing new aerogel-based products by predicting structure-affected functional properties. What will be the benefit for industrial producers as BASF from your results?